and presents a game-changing solution to revolutionize the industry. Curious? The first chapter of the book can be downloaded here. By 2050, the world’s population is estimated to grow to 10 billion. To feed everyone, we will have to double our food production, and produce more food in the next 40 years than in the last 6,000 years combined. 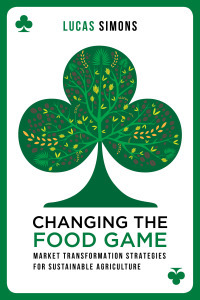 Changing the Food Game shows how our present food production system cannot support this growth. In this prescient book, Lucas Simons argues that the biggest challenge for our generation can only be solved by effective market transformation to achieve sustainable agriculture and food production. Lucas Simons explains clearly how we have created a production and trading system which is inherently unsustainable. But he also demonstrates that we have reason to be hopeful – from a sustainability race in the cocoa industry to examples of market transformation taking place in palm oil, timber and sugarcane production. He also poses the question: where next? Provocative and eye-opening, Changing the Food Game uncovers the real story of how our food makes it on to our plates and presents a game-changing solution to revolutionize the industry. transformation, and SCOPEinsight, a farmer organization assessment company that bridges the gap between professional farmer organizations, markets and sources of finance. Previously Simons was director of UTZ CERTIFIED, a leading global certification and sustainability standard organization for sustainable coffee, cocoa and tea. In 2011 Simons was honored as Young Global Leader by the World Economic Forum for his commitment and accomplishments in the field of sustainable trade, agriculture and rural development. In 2013 he became Ashoka Fellow for his pioneering role as a social entrepreneur and systemic change maker. 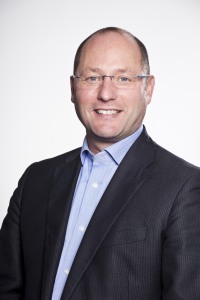 For the past three consecutive years (2011, 2012, 2013) Simons has ranked in the top 20 of most influential persons in Sustainable Development in the Netherlands (Trouw Newspaper). Lucas Simons holds an MSc Environmental Hygiene degree from Wageningen University and an MBA degree with Merit from Tias-Nimbas Graduate School of Management. For a deep dive into the book’s content, author Lucas Simons is available for a half-day workshop. During the workshop, your company’s sustainability strategy is analyzed and interactively translated into a winning strategy. Ideally the workshop is attended by around 10-15 people. A copy of Changing the Food Game is reserved for each participant. Contact Tessa van der Meiden for prices and scheduling. Strategic consultancy NewForesight, founded by author Lucas Simons, drives the sustainable market transformations discussed in Changing the Food Game. NewForesight has contributed to sustainable market transformations in agricultural sectors such as coffee, cocoa, sugar cane, floriculture, aquaculture and cotton. Clients have been, among others, the International Finance Corporation, World Cocoa Foundation, IDH – the sustainable trade initiative, the Dutch Ministry of Economic Affairs and major multinationals as Unilever and Mars, Inc.
NewForesight identifies four principal stakeholder needs linked with sustainable market transformations. The services attend to these needs. NewForesight offers an expert body of knowledge and can contribute with specific research to analyze the sustainability challenge in your sector. A program evaluation, market research and/or trends analysis contributes to a sound basis for a tailored theory of change on sustainable development within your sector. NewForesight can do this preparatory work and make sure your sustainability strategy is founded on a firm base. In an assignment for IFC, IDH, SECO and the Dutch Ministry of Foreign Affairs, NewForesight, together with Aidenvironment and IIED, undertook a study that reviewed the current state of sustainability in agriculture, with a focus on standards. Extensive desk and field research led to a model that lays out a variety of sustainability tools that enable a transition towards sustainable agriculture. The transition model includes VSS as being one of the potential tools. A report was published titled “Building a roadmap to sustainability in agro-commodity production”. See here for more information on this project. NewForesight envisions what sustainability looks like in your sector and develops the strategy, roadmaps and programs that lead up to the desired end state. An ambitious and achievable sector transformation must be underpinned by a strong vision and strategy. By analyzing the dynamics and relationships of complex systems NewForesight is able to identify the mechanisms, barriers and opportunities within them. This analysis is followed by intervention strategies that define timeline, actions and milestones towards your sustainability goal. Under assignment of the World Cocoa Foundation NewForesight technically facilitated the Cocoa Action strategy. CocoaAction aligns and coordinates the sustainability efforts of eleven of the world’s largest cocoa and chocolate companies. Productivity and community development interventions have been agreed upon, targeting smallholder farmers in Ghana and Ivory Coast (together responsible for 55% of the world’s cocoa production). CocoaAction’s vision is a rejuvenated and economically viable cocoa sector by 2020 that can compete with alternative crops and provide increased opportunities to cocoa farmers and their communities in Ghana and Ivory Coast. NewForesight brings together relevant stakeholders and facilitate the development of a shared vision and strategy. The sustainable transformation of a sector is impossible to attain through individual stakeholder initiatives. Key stakeholders from industry, public sector, and society must all be aligned on and take part in one overarching strategy in order to realize systemic change. All stakeholders relevant for sustainability in your sector are convened and helped in getting on the same page. NewForesight hears their concerns and understands their priorities. Commissioned by IDH-The Sustainable Trade Initiative, NewForesight facilitated the establishment of the Floriculture Sustainability Initiative. This initiative was founded to benchmark cut flower standards and promote sector sustainability. NewForesight assisted with a sound business plan, a tool for the comparison of flower standards, and governance and working structures. With these, the stakeholders in the floriculture business aligned on pre-competitive issues to jointly work towards sector sustainability. A milestone was reached in February 2015 when over fifty industry leaders (growers, traders and retailers) committed to 90% responsibly sourced flowers and pot plants by 2020. NewForesight assists key stakeholders in implementation and conduct evaluations for continuous improvement. Implementing a sustainable market transformation involves an elaborate toolbox. NewForesight can develop the necessary tools to put your sustainability strategy into practice. Tools include certification mechanisms, traceability systems and extension service delivery models, but also implementation manuals, Q&A´s and business models. In addition, NewForesight can help you design appropriate governance and organizational structures, including monitoring and evaluation mechanisms. For Bonsucro, a global non-profit, multi-stakeholder initiative aimed at improving the sustainability of the sugarcane production, NewForesight developed a traceability strategy for their certified sugarcane. Part of the strategy was the use of credit trading, allowing mills to sell their quotas independently of any physical shipment. To control the sale and purchase of credits, Bonsucro asked NewForesight to develop a Credit Trading System. For this purpose, first the rules and technical requirements of the system were defined in close collaboration with Bonsucro members throughout the supply chain, after which NewForesight built the Central Database incorporating all details agreed upon. NewForesight Consultancy and Nyenrode Business University are developing a sequel to Changing the Food Game on sustainable market transformation across different sectors, to be published by Taylor & Francis. Respected sector experts will contribute as co-authors to this book. It is expected to be published in March 2019. Do you have recommendations for this publication or do you want to contribute? The book is available in bookstores worldwide. at Stylus Publishing, Amazon.com, Barnes & Noble, Bol.com and Waterstones. Strategic consultancy NewForesight and social business SCOPEinsight put the theory of change elaborated on in the book into practice. Visit the websites for concrete examples of sustainable market transformations in agriculture.